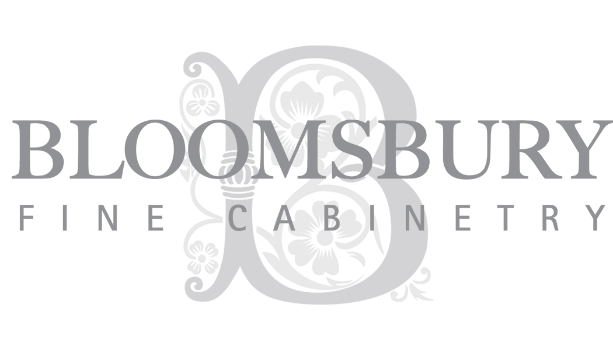 YORKDALE - Bloomsbury Fine Cabinetry Inc. Dark navy contrast cabinetry grounds this space and provides a beautiful backdrop for accents of brass, gold, and rift cut white oak. A dramatic statement hood in a rich black-blue hue accented with brass trim and rivet detail, flanked by rift cut white oak floating shelves makes for a breathtaking focal wall! In order to maintain the clean contemporary lines of this kitchen we outfitted it with loads of storage solutions such as; ample drawer space fit with custom all wooden inserts, waste/recycling center, custom paper towel pull out, coffee center with integrated fridge drawers and a hidden baking center behind a pair of pocket doors. This kitchen is perfectly fitted for the fun, vibrate young family who will enjoy it for years to come!